Over the past week or so I've been reading Pacific Prelude, a book Margery Perham based on the diary she kept during her visits to Samoa and Australasia in 1929 and 1930. Perham visited the South Pacific as an unknown young Oxford don, but by the time she prepared her diary for publication in the 1970s she was regarded, especially in conservative circles, as one of the foremost authorities on twentieth century British colonialism. Throughout her career Perham was most concerned with Africa, where Britain maintained an unwieldy collection of colonies until the 1960s, but she had become determined to visit Samoa after reading about the Mau Rebellion against New Zealand rule over the western part of the archipelago. 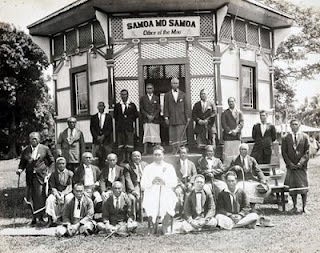 Angry at the Kiwi administrators who had turned up and imposed their authority during World War One, Samoan chiefs and half-caste traders had built the Mau movement around the slogan Samoa mo Samoa (Samoa for the Samoans). The Samoan resistance to New Zealand rule is not difficult to understand. From the beginning, the officials and security forces Wellington despatched to Samoa showed a mixture of racism, incompetence, and arrogance. During the global influenza epidemic of 1918 a fifth of Samoans perished, because New Zealand officials had been too incompetent to quarantine ships arriving in Apia, and too proud to ask for medical assistance from the America administrators of the eastern island of Tutuila. Later the New Zealanders had attempted to plant their Anglo-Saxon brand of capitalism in Samoa, by breaking up communal lands into individual plots and establishing special 'modernising' schools were local boys could be inculcated with bourgeois values. Samoan villages, with their apparently haphazard arrangements of fale and sprawling communal gardens, were forcibly 'tidied up' by the colonists, so that houses stood in rows before individual farmlets. Samoans who objected to the 'modernisation' of their society were rewarded with imprisonment or exile. Like the Kingitanga movement founded decades earlier in another region of Polynesia, the Mau did not simply reject colonial authority, but created its own institutions to take the place of palangi power. 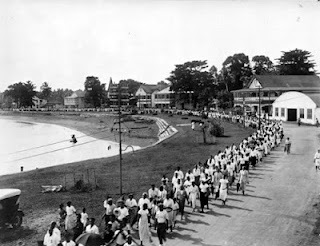 Supporters of the Mau witheld taxes from the colonial government in Apia, and ignored the commands of the colonial police force. 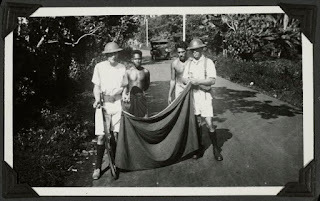 A well-organised Mau government was established at Vaimoso, a village beyond the southern edge of Apia, and policemen adorned in the blue and white colours of the Mau were soon seen throughout the colony. When New Zealand officials tried to leave Apia to investigate the rebellion they often found the roads blocked by huge logs and nationalists wielding clubs. Mass arrests failed to quash the movement, and by the time Margery Perham arrived in Apia in December 1929 the contradiction between the New Zealand state and the shadow state created by Samoans had become, for the colonists at least, intolerable. A few days after Perham's departure from Samoa, New Zealand forces would open a new phase in the struggle by turning a machine gun on a peaceful Mau march through Apia and killing eight men, including the movement's leader, the high chief Tamasese Lealofi. Samoans still refer to December the 28th, 1929 as Black Saturday. Early in 1930 hundreds of New Zealand marines arrived in Apia, and began a series of raids on pro-Mau villages in Upolu and Sava'i, Samoa's two main islands. As the nationalists hid in the bush and mountains, their fale were looted and burned. There were more shootings of unarmed Samoans, and the colonial forces even attempted a primitive air war against the Mau, by flying planes low over the interior of Upolu, and letting marines empty their revolvers into the bush. What Perham describes is an unwitting visit to the Mau capital in the village of Vaimoso. The 'bandstand' at the centre of the village was the movement's parliament, and the men meeting there were likely some of the most senior chiefs in Samoa. On another occasion Perham attempted to drive out of Apia late at night. Coming to a junction in the road, she noticed 'many torches', and then a crowd of Samoans 'standing beside logs, and ready to roll them' in her way. Perham had reached a Mau checkpoint, where she was stopped and questioned before being sent on her way. Writing up her diary the next day, she admitted being 'pretty hot' at having to 'submit' to the authority of the nationalists. Perham had as little regard for colonial hierarchy as she did for fa'a Samoa, and during her time in the islands she regularly buttonholed senior Kiwi administrators, asking them to describe and justify their policies. We went on to ask, 'Ought these Polynesian people be preserved? ..Apparently strong and beautiful, they wither away before Western pressures. Long isolated in their islands...they have had no reason to contrive and struggle, still less to reason. Nowhere in the world is life easier, that is why they sing and put hibiscus behind their ears. But now we have caught them in the net of the world economic system, and their beautiful leisure is menaced by the hunger of the Western markets for coconut oil and by the bee-like perserverance of the imported Chinese...We decided in the end to save the Polynesians, partly on moral grounds and partly because we must still regard the charge of economic worthlessness not proven. In this passage and many others in Pacific Prelude, Perham creates a dichotomy between Western-style modernisation and a sort of primitive stasis, and suggests that one or the other condition must be the fate of every society. She has no inkling of the complexity and fluidity of pre-contact Samoan society, or of the extensive contacts between the Samoans and other Pacific peoples in ancient times. Perham can only suggest, as a solution to Samoa's crisis, asking 'the expert, England' to add 'this small concern' to her vast imperial 'business'. It is perhaps not surprising that Perham found the Mau incomprehensible. With its rural basis, its chiefly leadership, and its insistence that Samoans are capable of governing and developing their own nation, the movement could not be assimilated to her worldview. Instead of engaging seriously with the Mau, Perham dismisses it in her diary as the work of a 'difficult people' with 'an inflated sense of their own importance'. Such a people requires the careful but firm governance that only Britain can provide. 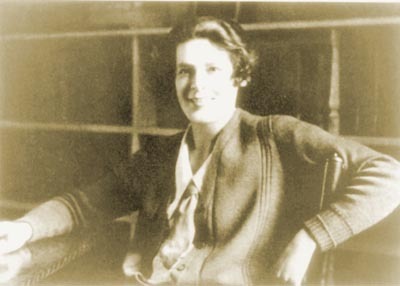 Perham showed the same habits of mind when she arrived in New Zealand at the beginning of 1930. After docking at Auckland, hitch hiking to Ngaruawahia, where she interviewed Princess Te Puea, and carrying on to Hamilton, where she found the locals 'as English-looking a crowd as you could find out of England', Perham caught a bus into the Ureweras with a group of Presbyterian missionaries. After a journey over mud roads and through a bushfire, she found herself at Te Whaiti, where 'dark, full-blooded...disreputable-looking aborigines' lived in 'hovels', and seemed wholly innocent of the English language. As she met followers of 'Rewa' Kenana and learned, with the help of bilingual Maori and Pakeha missionaries, of the prophet's rejection of Pakeha authority, Perham realised that she had once again found herself on the frontier of Anglo-Saxon civilisation. 'I had never realised there such wild parts of New Zealand', she told her diary. It is easy to laugh, today, at Margery Perham's Anglophilia. It is worth asking, though, how free we really are from some aspects of her worldview. We may no longer want the world to be run by ruddy-faced Englishmen in pith helmets, but how far have we journeyed, in the twenty-first century, from Perham's imperiocentric disdain for small nations on the fringes of modernity, and from her dichotomy between capitalist development and ahistorical stagnation? 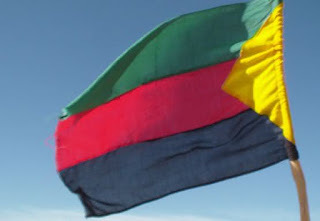 This month the world has gained a new unrecognised state, as the forces of the Azawad National Liberation Movement (MNLA) have taken control of the northernmost two-thirds of Mali, raising their flag in the cities of Gao, Kidal, and Timbuktu. 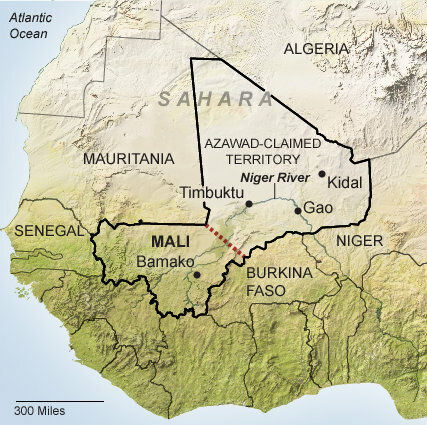 The MNLA's victories came during the latest stage in a decades-long war for independence by Mali's Tuareg minority. The Tuareg are a Berber people who have traditionally lived by herding and smuggling in the Sahara. After the so-called 'Congo conference' held in Berlin in 1884, at which European powers divided up Africa into colonial possessions, the Tuareg found themselves a part of the French territory of Western Sudan, which stretched from the deserts north of Timbuktu and Gao to the fertile flood plain of the Senegal River in the south. In 1960, when West Sudan became the politically independent nation of Mali, the Tuareg demanded a state of their own. They have complained, in the decades since independence, of discrimination at the hands of the populous south of Mali. Although Mali has been a democracy for most of the last two decades, its constitution prohibits Tuareg from forming their own political party, and from agitating for any sort of self-government. Now, in the aftermath of a shambolic military coup in the south of the country, the fighters of the MNLA have driven and ridden out of their desert bases and taken control, for the first time, of all of the historic territories of Mali's Berbers. The international response to their declaration of independence has been hysterical. France and other Western nations have condemned Azawad as an affront to 'regional stability', and a dozen or so African nations, including powerful Nigeria, have vowed to help the Malian state reconquer its lost northern possessions. For both Western and African governments, the borders given to Africa one hundred and twenty-eight years ago at the Congo Conference are apparently sacrosanct, despite the fact that they were drawn up without any African input, and cut across ancient ethnic and linguistic boundaries. The pious defence of nineteenth century borders by diplomats and politicians has been matched, over recent days, by an outpouring of mockery toward Azawad in the Western media. Under the sarcastic headline 'All Hail Azawad', New York Times columnist Frank Jacobs suggested that 'noone quite knows' where Azawad's borders are, and laughed at the pretensions of the Tuareg. In the US-based International Business Times, Palash R Ghosh was even more dismissive, describing Azawad as a 'non-existent state in a desolate, poverty-stricken wasteland'. For analysts like Jacobs and Ghosh, Azawad is a perversely centrifugal enterprise. By seceding from an African state that was already obscure and marginalised, the Tuareg people are isolating themselves from the centres of twenty-first century economic and political power. Do they not realise how difficult they are being, and what a false sense of their own importance they have? It is certainly instructive to read the denunciations of the new state of Azawad alongside the diary Margery Perham created more than eighty years ago. change the colour of your skin. A new militia in northern Mali, the Front de libération nationale de l’Azawad (FLNA) has emerged, opposed to both shari’ah (promoted by AQIM, Ansar Eddine and MUJWA) and independence for the Azawad in northern Mali (promoted by the MNLA); the group is being described as an Arab armed group, drawn from members of the Arab militia that fled Timbuktu following the advance of the MNLA, Ansar Eddine and associated forces; the group is led by a Mohamed Lamine Sidad (also transliterated as Mohamed Laime Sidat). The Arab ethnic focus speaks to distrust between Arab and Tuareg residents in the Timbuktu region especially. Historically, smuggling groups were often run by Arabs and Tuaregs separately and many Arabs in Timbuktu have feared being dominated by Tuaregs, and losing access to trade routes, during the course of the uprising. This highlights an increasingly important ethnic dimension to the evolving situation in northern Mali which has been ignored in some reporting that takes a macro-level view of the MNLA-led rebellion, although this is becoming less and less the case: Tuaregs are one of several ethnic groups in northern Mali and themselves are divided along tribal and caste lines; not all ethnic groups in the “Azawad” support the MNLA or Ansar Eddine; not all ethnic groups or castes support the rebellion at all. Individual members of one ethnic, tribal or caste group may support secession whilst others may not. The Songhay, Arab, Tuareg and other ethnic groups in northern Mali have not all rallied around the rebellion or any one faction. Many things remain in play. An article worth reading, or summarising, from Al Jazeera by Mohamed Mahmud Abu al-Ma’ali, a Mauritanian journalist who also has worked with ANI sheds some light on this. “A Salafist Emirate in Azawad….Has the hour of its birth come?” the article discusses the relationships between the main armed groups in the area and the possibility of a “Salafi emirate” being established in northern Mali. The article provides interesting details on the relationship between AQIM, Ansar Eddine and MUJWA, and fits with some other reports about these groups working closely together, overlapping in objectives, personnel and even leadership. The recent announcement that Iyad Ag Ghali, who leads Ansar Eddine was naming Yahya Abu el Hammam (an AQIM man) as the leader of the Timbuktu region also fits into the basic narrative provided by Abu al-Ma’ali. Because there is suspicion of Ag Ghali and Ansar Eddine among many Arabs in Timbutuku, the group has probably allowed AQIM to take a leadership role, since the group has stronger commercial and tribal links there and its membership is more heavily Arab. Other reports have AQIM or MUJWA taking a leadership role in Gao as well. Abu al-Ma’ali’s article begins with an overview of three of the main armed groups operating in northern Mali: The MNLA, Ansar Eddine (or Harakat Ansar ed-Din al-Salafiya) and the Movement for Unity and Jihad in West Africa. The essay analyses the social and ideological background of each group, as well as its ideology. The article describes the MNLA as a grouping of “secularists and independents” whose ideological orientation is not well understood among the general population of the Azawad. Although the MNLA claims to represent all tribal and ethnic groups in the Azawad its recruits and leadership are limited to the Idnan Tuareg. how many nations in africa are really viable? Interesting again Maps! What became of Margery Perham? We are still indeed very much affected by the old Imperialism which the new ones are basically a replacement of. Th differences between 17th to 21st Century Imperialism are real but the structure or the essence remains. And the C19th thinking is still with us. But Gosh etc could at least take the Tuareg seriously. They made fun of the Taleban but the "huge might" of the US British and even NZ forces of invasion have wasted nearly 12 years in a useless attempt to quell them, but they're still killing the invaders! and their lackeys, and they will soon triumph and reinstate the true and rightful rulers when the US et al are forced to retreat. As should be the case. A Mao tse Tung said, they (the US and other Imperialists) are paper tigers who are like imbecilic giants who life rocks only to drop them on their own heads, an action they repeat until their own doom. Margery Perham's views evolved somewhat. I think she'd modified her views a little by then. Her book is annoying, but it is still bloody good value as a piece of reportage. I couldn't believe some of the passages on Samoa. And I suppose we should acknowledge that it took considerable courage for a young single woman to travel round the world and hold her own with myriad powerful men eighty or so years ago.